Been diving in World? Please Vote! 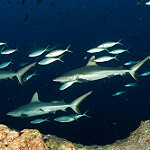 With so many destinations to choose from it is hard to decide on where to go diving next. Seven tenths of our planet is covered by water, and we live on the relatively small area of land that sticks up out of it. Ever thought of going to Brazil to dive? 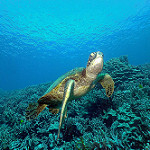 There is spectacular diving in Fernando de Noronha. What about catching the whale sharks in Utila, Bay Islands? How about Scotland? The sea tends to be on the cold side, the visibility under water is less than we would like, and it is subject to strong tides. But gales, fog, navigation errors and two world wars have dotted Britain’s coastal waters with a huge number of shipwrecks. Scapa Flow in the Orkneys has one of the largest collections of war wrecks in the world. As with most locations, diving can either be done from the shore or from liveaboards that can reach the more inaccessible sites. You might want to go see the seasonal migration of certain critters like Humpback whales and Whale sharks. Other places where diving is spectacular, if a little cold, include British Columbia with it’s giant octopus and California with its marvelous kelp forests at the Channel Islands. Don’t overlook the Mexican ocean either, where divers get a chance to share the waters with Humpback Whales in the Socorros Islands of the coast of Baja California. If you live in Europe, the closest world-class diving is found in the Red Sea, off Egypt, Israel (Eilat) and Jordan. Egypt’s booming scuba diving industry is proof of the popularity of diving there, and the cost of a trip there can be incredibly affordable. The Red Sea is unique in having, not only a profusion of coral, but also a plethora of diveable shipwrecks. Ready yet? Another popular spot is the Bahamas, where the waters are warmed by the Gulf Stream. 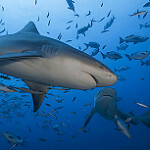 Bahamas is endowed with spectacular coral reef walls and renowned for shark encounters. 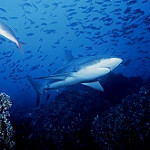 Other areas to which divers flock if they want to see sharks close-up include Darwin’s Galápagos Islands and Cocos Island, a tiny and remote island off the coast of Costa Rica. Most areas with coral reefs are found between the Tropics of Capricorn and Cancer. This includes the Caribbean, the Indian Ocean and a large part of the Pacific. The Caribbean is a favorite destination with divers from the USA, and normally dive operations in this area display the high level of efficiency and service on which their demanding American customers insist. Bonaire and Curaçao offer the easiest way to go Caribbean diving. The Cayman Islands are famous for over-friendly stingrays. The Keys in Florida provide the USA with its own homegrown coral reef diving, along with freshwater springs and several wrecks off Fort Lauderdale. Cuba forms the northern barrier of the Caribbean, and it’s reefs are becoming more popular every year. Mexico, with its wild Yucatan Peninsula, offers both reef and cavern diving, while Belize has the second-largest barrier reef in the world. The Maldives is a nation comprising a thousand tiny islands sprinkled across the Indian Ocean. Strong ocean currents feed the reefs among their atolls with nutrients, and all sorts of open-water marine life is drawn in. Close encounters with giant manta rays are almost normal for divers here. Kenya, bordered by the Indian Ocean, is earning a reputation for wildlife safaris below the surface as well as on land, and the paradise provided by the palm-fringed islands of the Seychelles hosts great tropical diving too. We must not forget the Indian Ocean shore of South Africa with Sodwana Bay and Aliwal Shoals. The vast island nation of Indonesia, together with Burma, Malaysia, Thailand, Philippines and Papua New Guinea, provides a wealth of world-class tropical diving, and Australia offers, of course, the Great Barrier and little known Ningaloo reefs. The latter is famous for guaranteed encounters with gentle whale sharks, the largest fish in the sea. Across in the Pacific, the thousands of islands that make up Micronesia, French Polynesia and Hawaii dot the almost endless tracts of ocean. The wreck sites of the Solomon Islands and Truk Lagoon are legacies of the Pacific war. 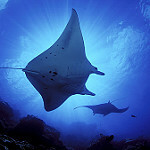 Palau is famous for its wall diving; and Yap for its visiting giant manta rays. The list goes on and on. South Africa and the southern coast of Australia have the great white shark, star of Jaws. Bolder divers pay to spend a dive inside a shark cage and experience the almost unimaginable. Feeling inspired and raring to go? Check out our World travel guide and start planning your next diving trip! Diving in Polynesia is great.